Managing accounts payable is a common practice in every commercial establishment. Whether you deal with goods or provide services, materials and supplies have to be purchased to conduct ordinary business. However, recent changes to network infrastructure have made it possible for businesses to streamline this process. Purchase orders, invoices, and other documents can now reach their destination using any number of protocols on the Internet, such as e-mail. These tools allow organizations like yours to lessen the amount of paper produced and handled, which increases productivity and reduces overhead costs. 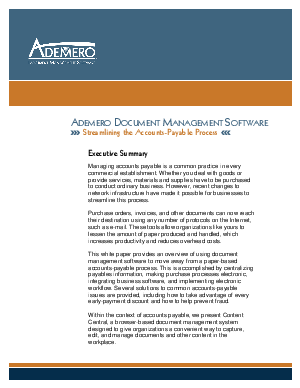 This article provides an overview of using document management software to move away from a paper-based accounts-payable process. This is accomplished by centralizing payables information, making purchase processes electronic, integrating business software, and implementing electronic workflow. Several solutions to common accounts-payable issues are provided, including how to take advantage of every early-payment discount and how to help prevent fraud. Within the context of accounts payable, we present Content Central, a browser-based document management system designed to give organizations a convenient way to capture, edit, and manage documents and other content in the workplace.